SigLite® BT 1×5 has all the benefits of Topaz electronic signatures plus the additional feature of wireless capability through Bluetooth. 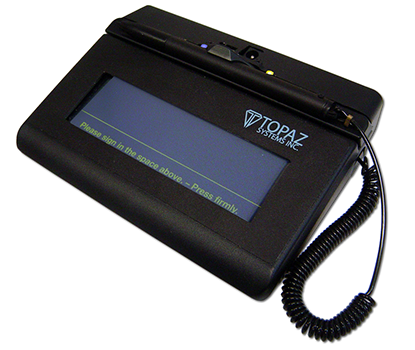 It features all the high-quality biometric and forensic capture techniques of a SignatureGem® tablet but with a low-cost touchpad and stylus in place of the active electromagnetic pen and sensor. Featuring a touchpad (protected by an optional replaceable overlay for longer life) and stylus, this model shows the signature on the computer screen.